Jason Isbell and the 400 Unit are rightly acclaimed as one of the best live acts doing the rounds today and it’s no surprise to find that they have released a live album in an attempt to capture the on-stage magic which is so beloved by fans. Recorded over a six-night residency at that fabled auditorium in Nashville, ‘Live From the Ryman‘ is a collection of 13 excellent songs pulled from their last three albums (‘Southeastern’, ‘Something More Than Free’ and ‘The Nashville Sound’). Isbell and the band don’t hang around as the album kicks off with the rocky ‘Hope the High Road’ and then launches into the anthemic ‘24 Frames‘ before Isbell lets his vocals loose on ‘White Man’s World’ with its highly charged commentary on the current race, gender and class contradictions that are in the spotlight throughout the U.S.A today. It’s not all politics though as they move on to ‘Flagship‘, a cleverly penned ode that encapsulates both the hope and the desire of avoiding the sort of creeping relationship apathy than Isbell sees insidiously permeating its way into the lives of many couples. Among the standout tracks are a quite brilliant seven-minute-long version of ‘Last of my Kind’ and the powerfully emotive ‘Elephant‘ which, aided by some wonderfully poignant fiddle playing from Amanda Shires, so eloquently describes the loneliness and emotional roller coaster of a friend’s battle with cancer. Few who have been touched by that disease will fail to recognise the feelings which lines like “When she was drunk she made cancer jokes, Made up her own doctor’s notes, Surrounded by her family, I saw that she was dying alone” can evoke. ‘Live From the Ryman’ is full of really great songs and it can be viewed as a sort of “greatest hits live” album and on a number of levels it succeeds wonderfully. However, the fact that the tracks were recorded on different nights means that the continuity and flow of the album is just lacking that little bit of cohesion and it detracts just slightly from the immediacy and intimacy you would expect if it had been recorded as one complete concert. This is compounded by the fact that the sound mix is a little variable, again taking away just a little from the overall cohesiveness of the album. For many though, these points will be nit-picky and possibly even sound a little churlish and they shouldn’t diminish what is a very fine album indeed. 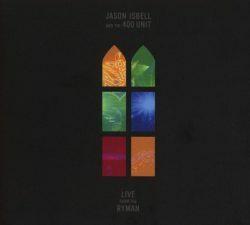 Jason Isbell and the 400 Unit are brilliant live, and ‘Live From the Ryman‘ is definitely an album you should listen to and buy. If you have been living under a rock for the last few years and this is your first exposure to them, it will make for a great introduction to their music.